The first rule of creedbombing, according to Ben Jacobs, is “you can’t request a creedbomb…That’s not how it works. It’s got to be natural.” So, if someone suddenly invades your personal space this Sunday, go with it, and pray that they’ve yet to find the hot wings. Peyton Manning’s free fall into parody status this season isn’t Creed level, but it’s close. He’s a shell of his former self. His season has been marked by constant interceptions, injuries, and benchings……..yes benchings. The (arguably) greatest regular season QB of all-time looked absolutely brutal during this, his likely final, regular season. Then the playoffs started, and while Peyton hasn’t been lighting it up the past few weeks, he hasn’t turned the ball over either. He’s made the necessary transition from superstar QB to “game manager”. His number one ranked NFL defense has had his back. On Sunday, Peyton will be asked to get rid of the ball quickly when he throws and lean on his running backs against a Carolina defense that’s just a tick worse than the Denver unit. If the Broncos win, Peyton won’t be the MVP of the game, but he’ll retire fittingly with a championship. This side of Walter Payton, there has never been a more sentimental favorite player to root for to hoist the Lombardi Trophy. Who will win? The Panthers are favored by 5.5. Cam will get off to a fast start and get his team up early, but the Broncos defense will adjust, keeping the game close in the first half, despite an untimely interception courtesy of Mr. Manning. 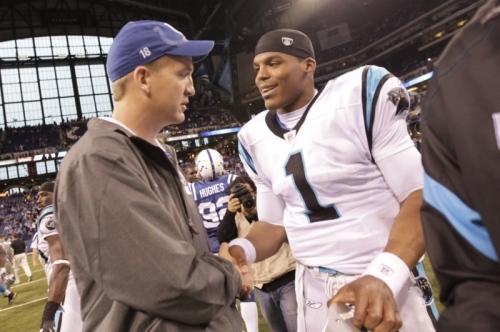 Newton will be human in the second half, with a turnover or two of his own, but Peyton just won’t be able to get the ball down the field enough to make Cam pay. Prediction – from “My Own Prison” – Take the ponies and the points, but it’s the kitties by the in-your-face-inches-distance of a creedbomb, Carolina 27-23. I don’t know. I think I would be more embarrassed by someone finding a Limp Bizkit CD in my car than Creed. At least with Creed I could back out of it by saying I was going through one of those slightly illiterate and religiously vague Oprah/7th Heaven spiritual journeys. With Limp Bizkit, even though the True Love Waits rally guilted me in to doing none of it for the nookie, the response would still be massive shame. There was some bad music in the 90’s for sure. The millennials have it rough – God bless ’em. I always have liked Creed, even if they have become a tad ‘one note”.